Naveed is sick of war - of the foreign powers and the Taliban, the warlords and the drug barons that together have torn Afghanistan apart. He's had to grow up quickly to take care of his widowed mother and little sister, making what little money he can doing odd jobs and selling at the markets. From the winter of war comes the spring of hope. .
'Naveed brings a human face to a war we have heard so much about. 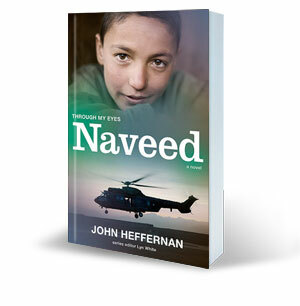 John Heffernan has allowed us an important glimpse into the world of an Afghan child and an insight into the complexity and beauty of the Afghan people. In Naveed, we have a name for the thousands of Afghan children who are suffering through this terrible war. Through his optimism, we are offered hope. ' - Neil Grant, author of The Ink Bridge.